Peppermint Oil is prepared from peppermint leaves with steam distillation technique. It is an herbal ingredient used in several cosmetic products and traditional medicines. It is beneficial in headache, respiratory diseases, upset stomach, abdominal pain and cramps, headache, muscle pain, sinusitis, joint pain, chronic fatigue, pruritus (itching), fever, skin inflammation, acne, hair loss and hair thinning, irritable bowel syndrome, bloating, nausea, colic, polycystic ovarian syndrome and cancer. Menthol (C10H19OH) is a primary active constituent in Peppermint Essential Oil. In addition, it contains menthone and menthyl esters. It contains magnesium, iron, folate, manganese, copper, potassium, vitamin A and Vitamin C and omega-3 fatty acids. 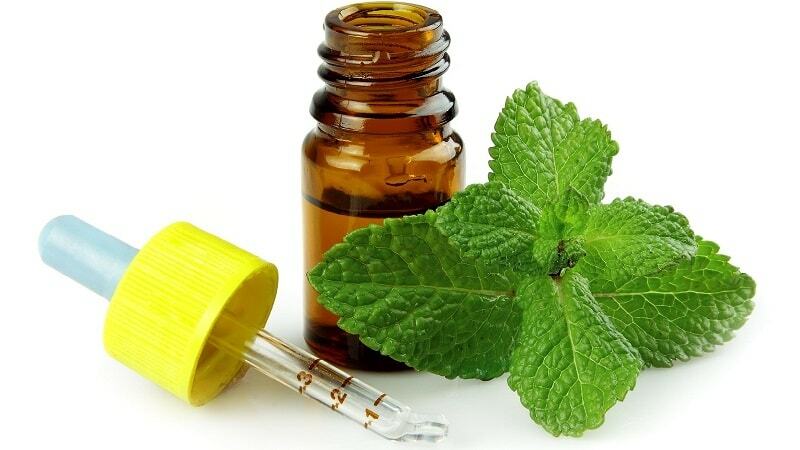 Peppermint oil acts on oral cavity, stomach, intestines, lungs and mind. It reduces abdominal cramps due to its antispasmodic action. It has antimicrobial properties, which helps to fight against several infections, especially upper respiratory tract infections. Its Inhalation helps to improve concentration, attention span, and mental alertness. Generally, Peppermint Essential Oil is applied to the affected are on the skin. It is present in pain relieving gels and creams. It is also an ingredient of medicated soap, toothpaste, and shampoo. In respiratory problems, it can be mixed with eucalyptus essential oil and used as vapor rub. In hair loss and scalp itching, it can be added in the shampoo and mixed in coconut oil to use it for scalp massage. In skin problems, it can be applied on the affected parts. If dilution is necessary, then add a few drops of peppermint essential oil in coconut oil. The essential oil of peppermint can also be taken placing a drop on the tongue. It can also be added in lukewarm water. Doses: In children, it can be given once a day or use it as required or recommended by a herbalist. In adults, 1 0.2 to 0.4 ml twice or thrice daily is a sufficient dosage to get relief in most of the health conditions. When to Take: After meal – Breakfast, and Dinner; it is also taken on an empty stomach. When it is taken after a meal, it is well-tolerated. Treatment Duration: 3 days to 4 weeks; treatment duration with peppermint essential oil can vary as per health conditions. Peppermint Oil is also available in the market in form of softgel capsules, which are commonly used for abdominal diseases including irritable bowel syndrome (IBS), intestinal spasm, bloating, gas, bronchitis, breathing trouble, congestion etc. Adults 1 to 2 capsules – 2 to 3 times a day or whenever required. Doses: In the case of children, it can be given once a day or use it as required or recommended by a herbalist. In adults, 1 capsule twice daily is a sufficient dosage to get relief from most of the health conditions. Treatment Duration: 3 days to 4 weeks; treatment duration with peppermint essential oil capsules can vary according to health conditions. The external application mixed with base oil and inhalation of Peppermint Oil is likely safe when used as recommended by a herbalist. Internal (oral) intake of Peppermint Oil is also possibly safe when used less than 0.4 ml twice daily or 0.8 ml per day. Higher dosage can cause burning sensation or burning pain in the abdomen and heartburn. The common side effect of the Peppermint Oil is heartburn, occurring when it is taken orally. The effect is also dose-dependent. Most of the people can tolerate in the recommended dosage as described in this article.